As mentioned in our last lesson, today we are going to examine the character with its Oracle Script as . What is the meaning you have tried to figure out? 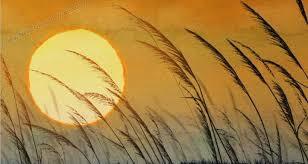 So means "the Sun raises just above the grasses" or "the Sun sets into grasses"? With what we have learnt, there are characters for mornings as 旦 and 早. here should be "the Sun sets into grasses", which is evening. We can see that at period of Clerical Script , lower of was simplified to . and we finally get 莫. Since sunsets means the Sun is gone and cannot be seen any more, 莫 was eventually borrowed to mean Not or Nothing or Nobody. After that Chinese ancestors then created a new one to represent evening on top of 莫. If it was you, how would you create the new character?